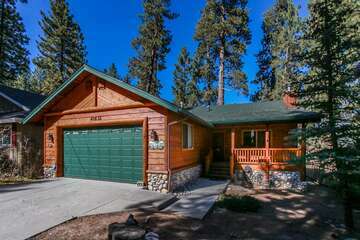 Fun for the whole family, Big Bear Lake has a host of activities that make visiting well worth your while. Particularly during the Summer, Big Bear Lake becomes a focal point for family trips to the lakefront, where you can bask in the sun and take a dip in the lake. Read on to learn more about swimming in Big Bear Lake! Meadow Park—in particular, McDill Swim Beach—is perfect for parents wishing to bring their children to a safe place on the lake to swim. A lifeguard remains on duty, and there are water toys, a floating dock, a snack bar, and public restrooms nearby. Another family-friendly swimming option is the East Boat Ramp Beach, which is also conveniently located near bathrooms, a fishing dock, and the shopping centers that have Vons and Stater Bros. When you embark elsewhere on the lake, you’ll find that there are no lifeguards, so proceed with caution. Swimmers are required to stay within fifty feet of the shoreline. Boulder Bay Park is great for wading in the water, though it’s also known for kayaking. Garstin Island, also known as China Island, is perfect for short jumps off of its distinct rock formation and into the cool water below. Big Bear Dam, located on the northern shore of the lake, has a beach that varies in size according to the water level and makes for a nice swimming spot. Re-live some of your favorite camp movie scenes at Big Bear Lake, as Big Bear Lake has served as a set for hundred of films. Afterward, grab a bite to eat at the Grizzly Manor Café or enjoy a cold pint at Big Bear Mountain Brewery. 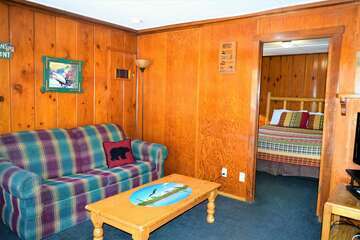 At Big Bear Cabins, our business is to ensure that our guests have the kind of once-in-a-lifetime vacations that keep them coming back again and again. The surest way to accomplish that is to offer the greatest selection of vacation rentals, from rustic cabins to large luxury vacation homes with boat docks and spas, as well as offering the best customer service around. Our friendly vacation planners are more than happy to answer any questions you might have regarding the location and amenities of our cabins, nearby attractions and activities, the vacation rental process, and more. 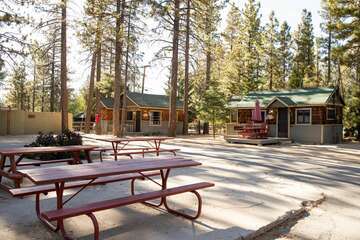 Contact Big Bear Cabins today and reserve your own private cabin the middle of one of the most scenic forests of Southern California!